Posted On June 02, 2017 by Team iCynosure. In the final scene of the fourth season of 'House of Cards', Frank Underwood looks straight into the camera and declares, "We don’t submit to terror. We make the terror". More than the words, the treatment of the scene leaves viewers intrigued as, though Frank does the talking, Claire Underwood's gaze conveys the message of the first couple as a team, a ruthless unit that would stop at nothing for power and position. Fans have been looking forward to seeing the power couple stand by each other in the new season, but as the trailer for the fifth season was aired, it highlighted a dark reference of the fourth season with featuring an upside-down flag of the United States, fluttering against a bleak, cloudy sky with children reading the Pledge of Allegiance. It did not give away anything except a glimpse into a menacing beginning. 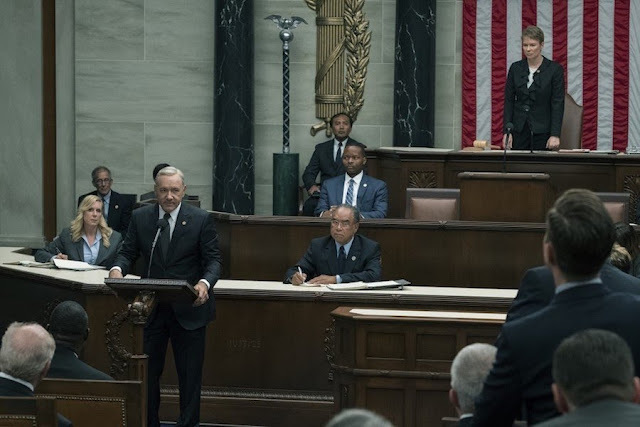 The opening episode is marked with a cynically scathing speech made by Frank Underwood about the sensibilities of American citizens and given the current political scenario, the speech is so much 'art imitating life' scenario. The president declares war in the congressional session against terrorism, prodding a divided house to come together at the same time taking away the focus from impending investigation against himself. Another scene that will connect with audiences is the funeral, where the family of the victim dishes out against the president for using their situation to forward his political agenda. 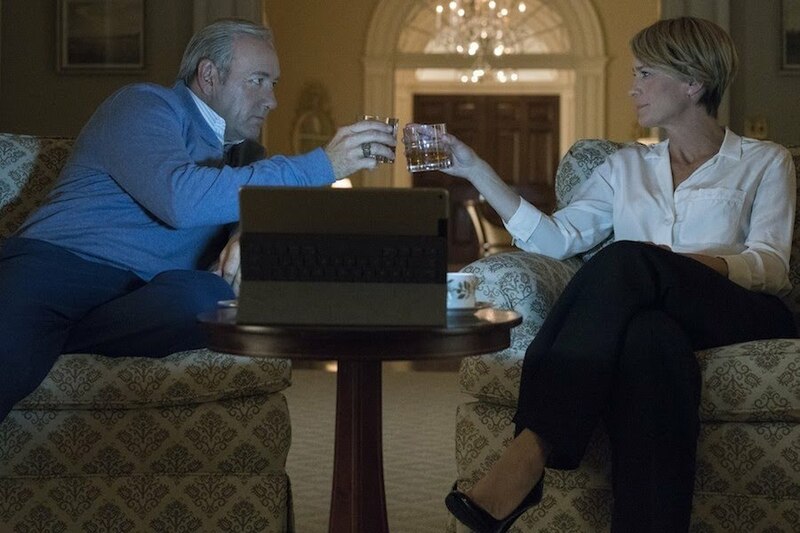 Though the entire episode is an ode to the Underwood’s thirst for power, the scene that stands out is the quiet peering by the first couple outside the White House. The manner in which the scene is shot gives it a realistic approach by which the outside world is scrutinised in the eyes of the White House while the inhabitants within get away with murder. Even after the episode ends, the words spoken by Frank Underwood continuously rings in the ears, "The American people don’t know what’s best for them. I do. I know exactly what they need. They’re like little children, Claire. We have to hold their sticky fingers and wipe their filthy mouths. Teach them right from wrong. Tell them what to think and how to feel and what to want. They even need help writing their wildest dreams and crafting their worst fears". Sounds so real, isn’t it? Yes, and that's the reason you have 'Nothing to be afraid of' or in reality does it actually mean 'Be Afraid'? Well, it's for audiences to find out, in this rollercoaster ride of power, revenge, emotions, and more. To understand the human dynamics in the series, first catch up on the previous seasons on Netflix, if you haven’t watched House of Cards season 1 to 4, else sit tight and enjoy the ride.